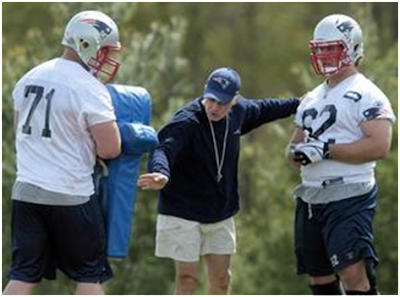 Patriots rookie offensive linesman John Wise, far left, and veteran guard Stephen Neal both transitioned from college wrestling to professional football. Neal said he told Wise the best way to acclimate is listening to everything he’s told about the game and having an open mind. It’s been nearly a decade since this college wrestler began to come to grips with pro football. Wise and Porter are Neal wannabes. Porter, the former Kent State wrestler, didn’t last long in New England, but he moved on to Kansas City where he is listed as an offensive tackle with the Chiefs. Wise, who played a year of college ball as a defensive lineman at Western Illinois before transferring to Illinois where he developed into a wrestling All-American, signed with the Patriots late last month and took his first steps as an offensive lineman with the team at last weekend’s rookie minicamp. Keep your mind open, mouth shut and most of all, make sure the spirit remains willing. “I said, ‘Hey, man, just come out here and try to learn as much as you can. Just do what they tell you,’ ” said Neal, who originally signed with the Patriots as an undrafted free agent in July 2001. “Because everybody knew a lot more about football than I did when I first got here. Neal is going to the mat for the program from whence he came, Cal State-Bakersfield, where he compiled a career record of 151-10 with a pair of NCAA Division I titles. In February, the college was informed that, due to the California budget crisis, $1.4 million would be needed by May 21 to save the wrestling, women’s tennis, and men’s and women’s golf programs for a period of two years. Neal, who has been actively involved in fundraising efforts, reports that the Roadrunners’ wrestling team has raised $500,000. A dinner auction to raise money for the cause is set for May 15 at the Jam Events Center in Bakersfield. To this day, Neal says that opportunity paid off for him, providing him with experience he relies upon from time to time in a sport where he has collected three Super Bowl rings. “The biggest thing for me is when things don’t go the way they’re supposed to go, I can recover because I’m used to hand fighting and wrestling and getting off balance,” said Neal, who has appeared in 78 games in an injury-plagued career.